No play-by-play "my take" of the dishes for you, just those that stood out for me. No need for me to play the food critic, who am I anyway? 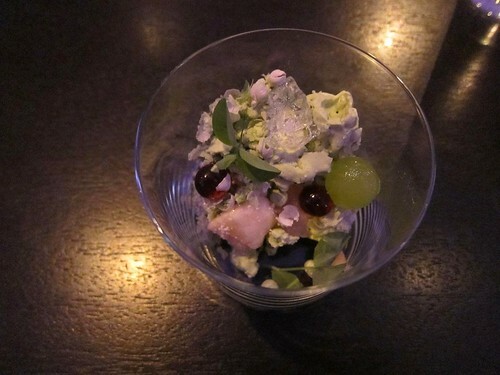 Alinea's is a meal worth experiencing, and I'm just going to share my experience. A nondescript door. If it wasn't for the valet parking sign, you wouldn't notice the place. Down the hallway a sliding metal door to your left. 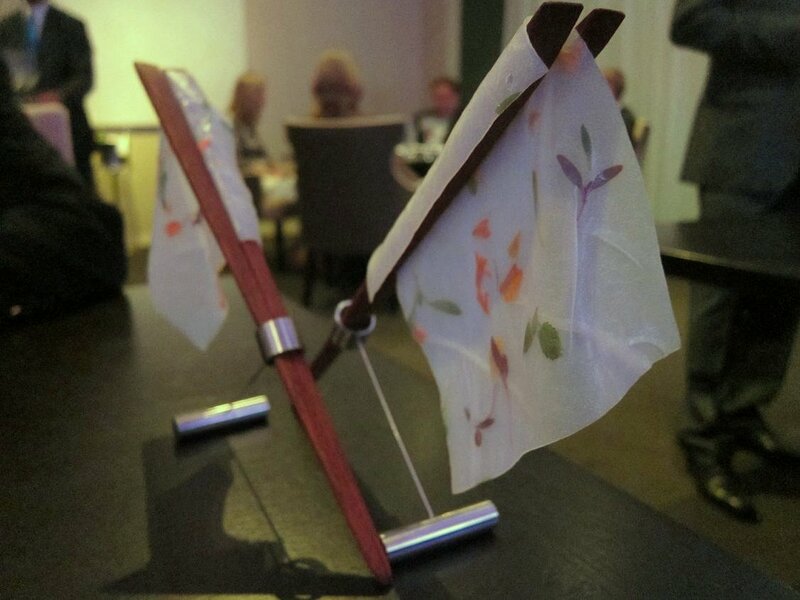 We were led to the second floor and these "flags" of flower-pressed rice paper were placed on our table. "Don't eat it yet. Just sit and admire them for now." Bayleaf stemmed out of the fried shad roe, but it's only for the aroma. Eat everything else in one bite. 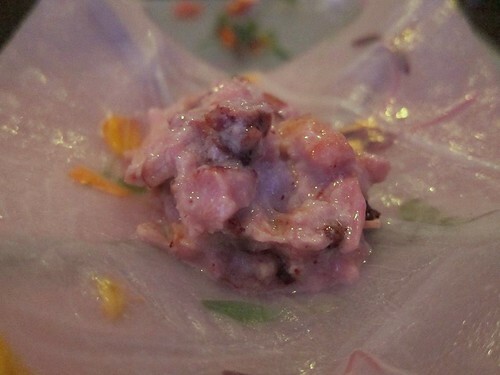 Yuba (shrimp, miso togarashi) - the shrimp is wrapped around the dried yuba. Chao Tom (sugar cane, shrimp, mint) - "Chew but don't swallow." 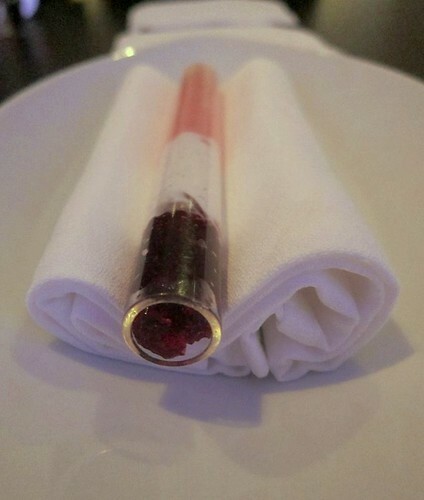 An extra napkin was provided for you to spit out the chewed sugar cane gracefully. Or try to. I saw the video about this "flavored water" and totally thought it was an April Fool's joke. No joke. 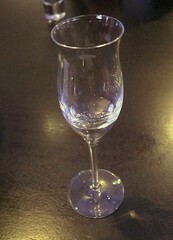 This glass of water was absolutely spiced with thai spices. This shot of 'water' is just a primer for the next course. Pork Belly (curry, cucumber, lime) - a DIY spring roll. This was paired with: Abbazia di Novacella Kerner, Valle Isarco, Alto Adige 2008. "Pick up the glass and place it in front of you"
Salt, fried shallots, bananas, basil seeds, cashews, onions, chili paste, etc. Then we had to arrange the metal contraption and they placed the flower-decked rice paper we've been admiring all this time. Topped it with deliciously creamy and fatty looking pork belly. Add all the condiments in (yes, ALL), and wrap. Paired with: K Vintners Viognier, Columbia Valley, Washington 2008. 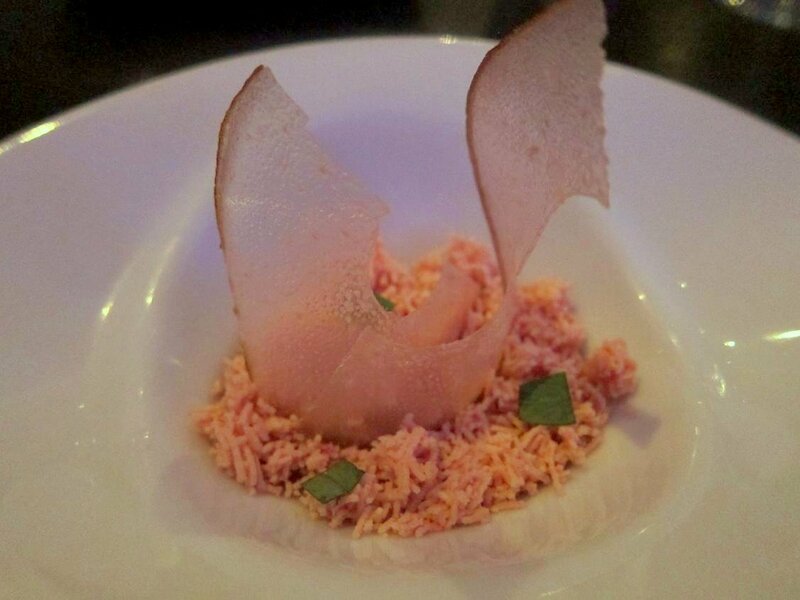 The Parfait (chilled lobster consomme, greek yogurt, grapefruit cells, ginger pate de fruit, poppy seeds and pistachio-butter powder, topped with quenelle pistachio ice cream and poppy seed nage). "Don't touch the bottom part, it'll burn your hands." Confused (because the parfait is chilled), we asked, what could possibly make it so hot. "Oh, I can't tell you something like that." Upon finishing our parfait, the servers lifted the top, revealing, voila! 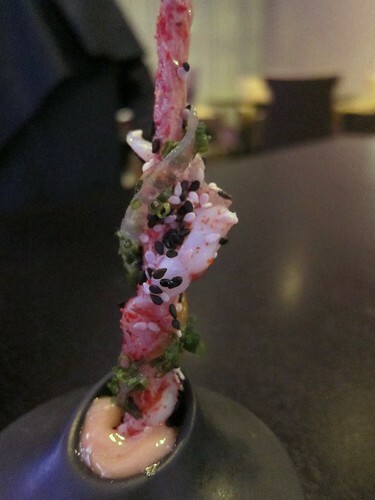 the Salad (Eggplant confit and Poached Lobster). 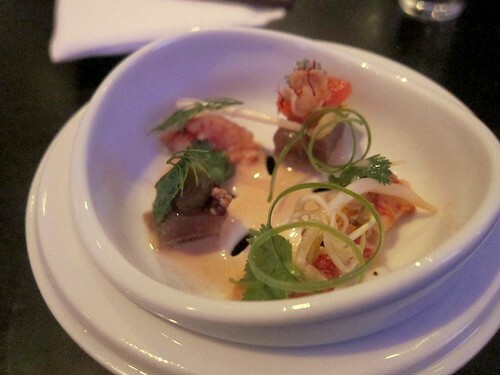 The server poured lobster bisque over the salad and it traveled down the slits on the bowl. "For aroma," he said. 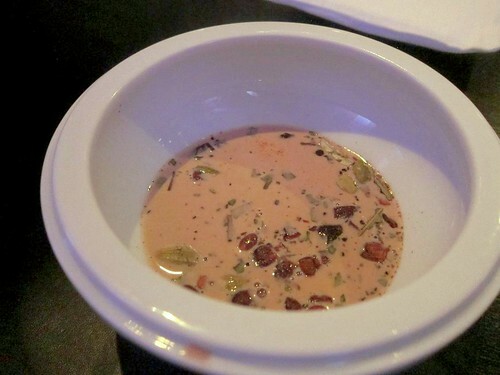 Again the bowl at the top is removed, this time revealing various spices soaking in the poured lobster bisque. Lobster bisque meets Masala chai? Yes, please. Paired with: Casar de Burbia, Bierzo, Spain 2006. Paired with: Reinhold Haart 'Piesporter Goldtropfchen' Riesling Auslese, Mosel 2002. 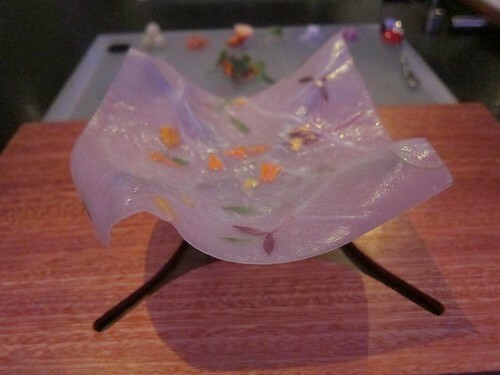 A three-layered dish. 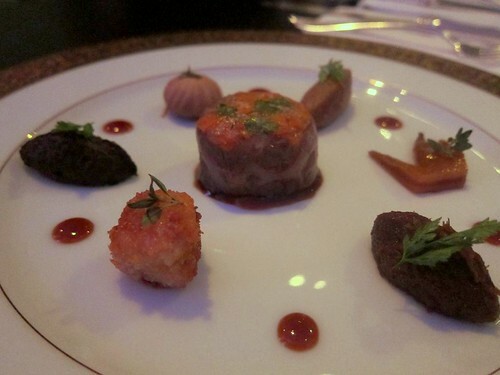 The pink/orange crumbles you see on top are the foie gras. A nice pairing with the late harvest Riesling that cuts the richness and sweetness. Sushi rice gelee topped with the above. 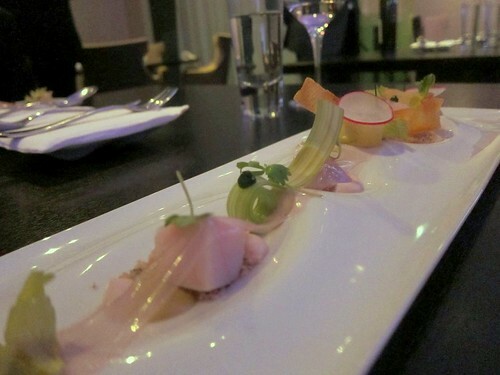 Smoked sturgeon topped with leeks and potato-sauce-sheet. 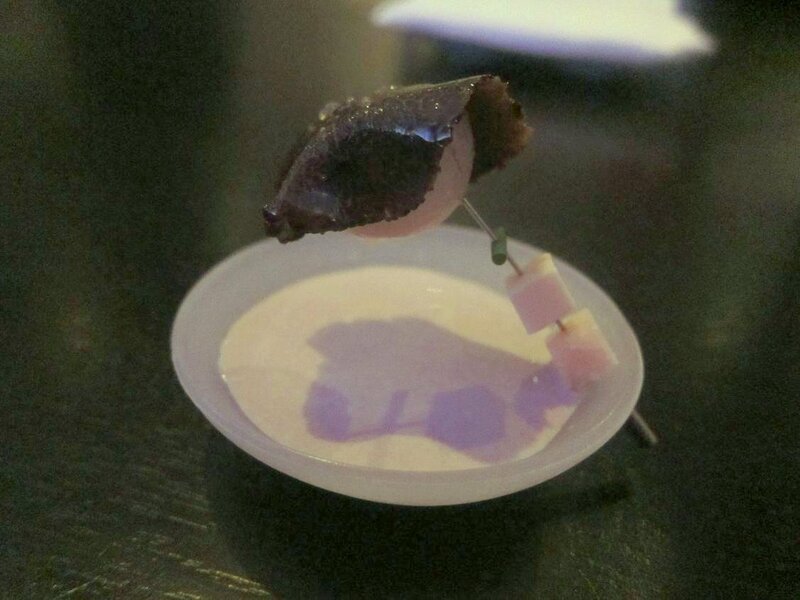 This dish was created by sous chef Andrew Graves and apparently the first dish in Alinea history to be introduced on the menu before Chef Achatz being on hand to see the final prototype. 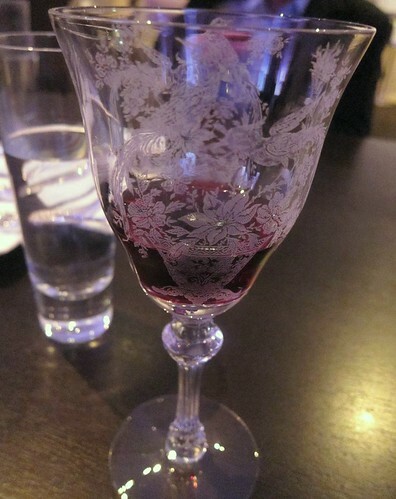 At this point my wine glass was switched out to this gorgeously decorated antique wine glass. This was filled with the wine for the next pairing: Albert Morot Beaune-Toussaint 1er Cru, Cote de Beaune 2006. The sommelier explained Burgundy has been making "ready-to-drink" wines to compete with new world producers. Though I didn't really think it was "ready to drink" (drink-able, but much too tannic), I'm hopeful for the pairing. 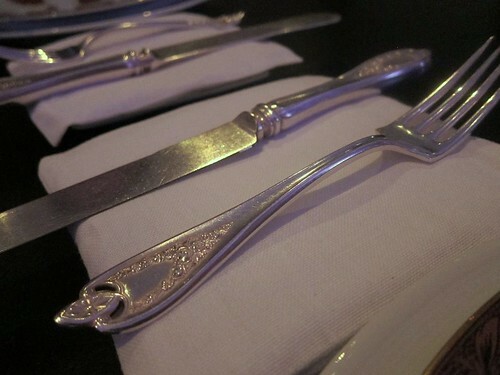 Our next silverware was also noticeably antique. Filet de Boeuf (godard) - wagyu tenderloin, black truffles, mushroom cap, sweetbreads, cockscomb (yes, cockscomb - see it? 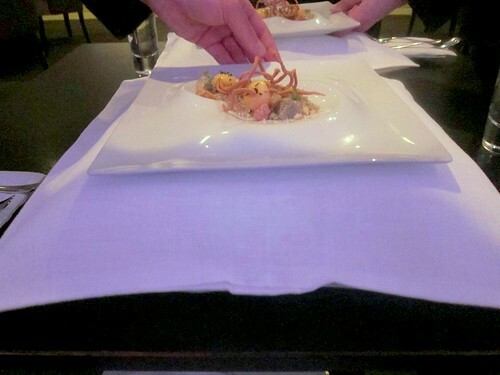 right hand side), quenelle of beef mousse. 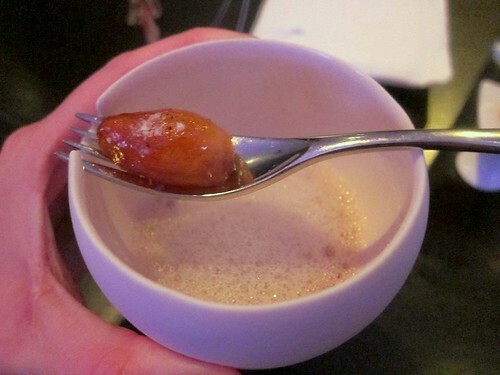 Alinea has been introducing an "antique" dish, "interrupting" their typical meal with an iteration of a classic recipe from Auguste Escoffier's 1903 cookbook, Le Guide Culinaire. The pairing ended up working pretty well too as the astringency of the wine and the richness of the dish balance each other out. 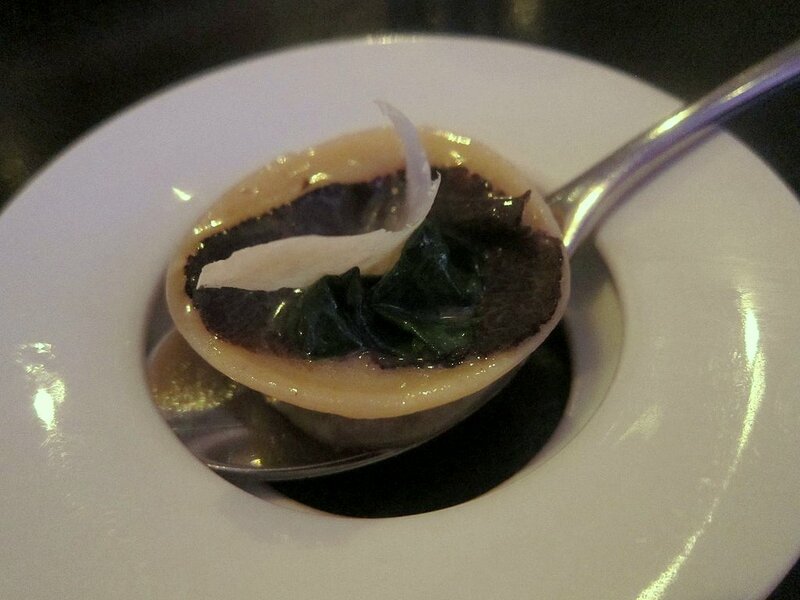 A ravioli filled with black truffle "tea", topped with a slice of black truffle and butter. Lots of truffle essence here. Love it. Paired with: Anima Negra "An", Mallorca, Spain 2005. 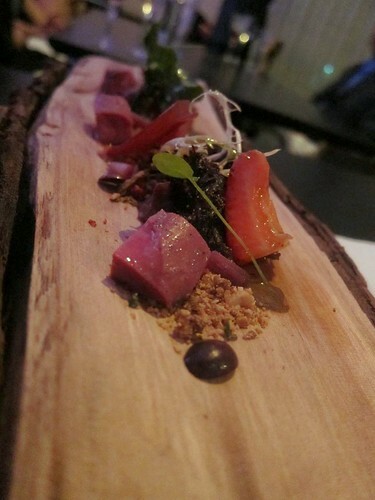 Probably the most memorable dish, the heated birch log was emitting this wonderful aroma. We stopped and smelled for a few seconds before proceeding with our food. "Hold it level, and take it in one go from the red end." 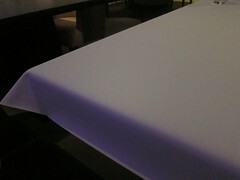 At this point our table is cleared and a silicone cover is placed over it. 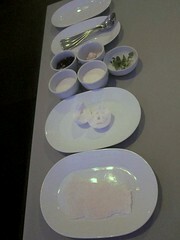 The ingredients for our final dessert is placed on the side. 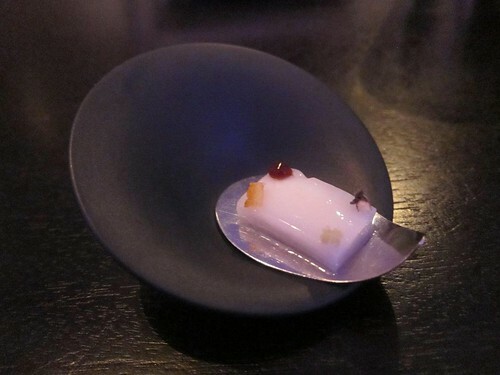 I had seen the chef de cuisine came out and prepared this dessert for another table that night, so it wasn't a total surprise. 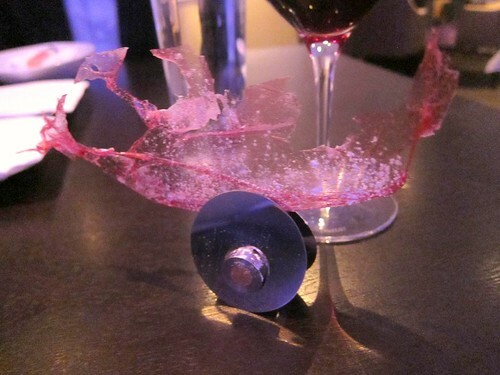 Still, I was hopeful ... and lucky me, Chef Grant Achatz himself came out to our table and prepared our table-top dessert. 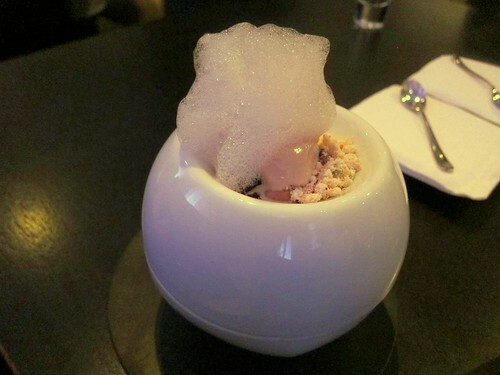 Coconut milk, chewy coconut, menthol cream, frozen coconut mousse, warm coconut mousse. 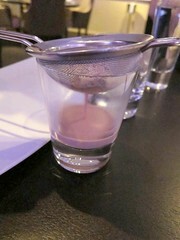 The clear cylinders were then removed revealing the now-solidified warm chocolate mousse. And voila. We attacked it and turned it into a Pollock. 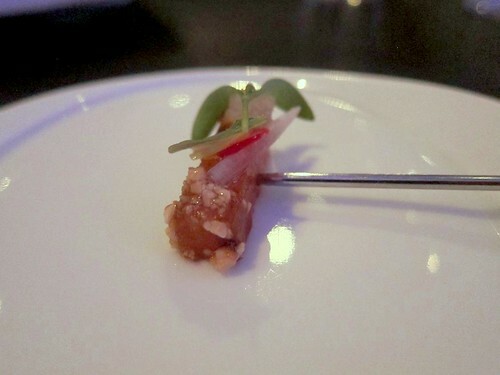 So there you have it, the Alinea Tour for $225 per person (and $80 for my "mini" wine pairing that was not so mini after all), a truly unique dining experience. So so so jealous. I loved all the instructions! This food is like magic. "Chao Tom"! 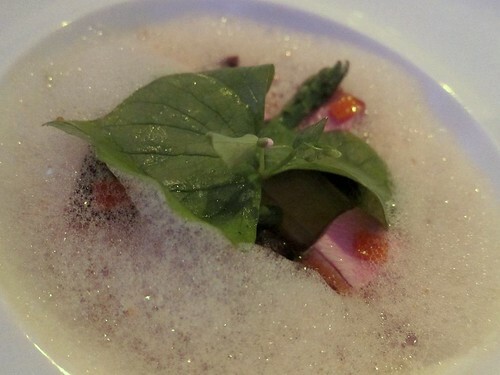 Grant Achatz does Vietnamese food. How cool! 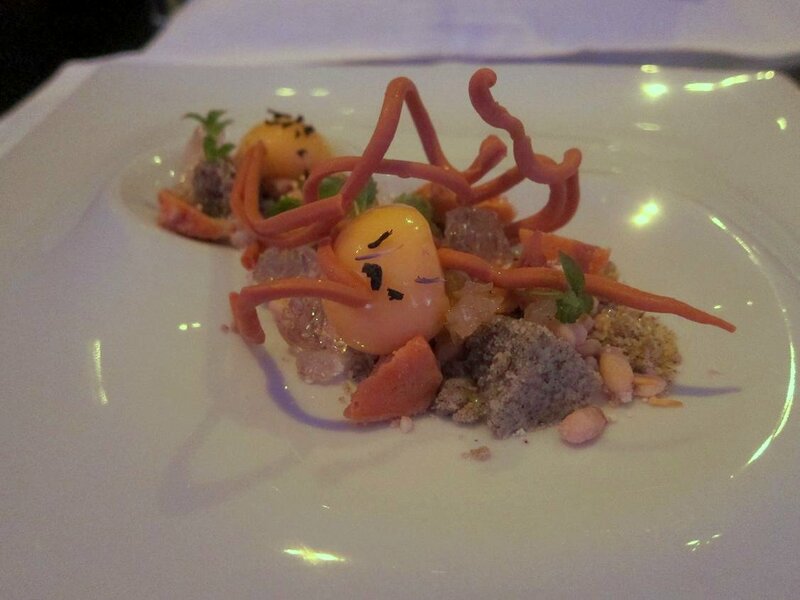 Need to get my buns back to Alinea. My favorite meal EVER. Wow! Could you breathe after all that food? 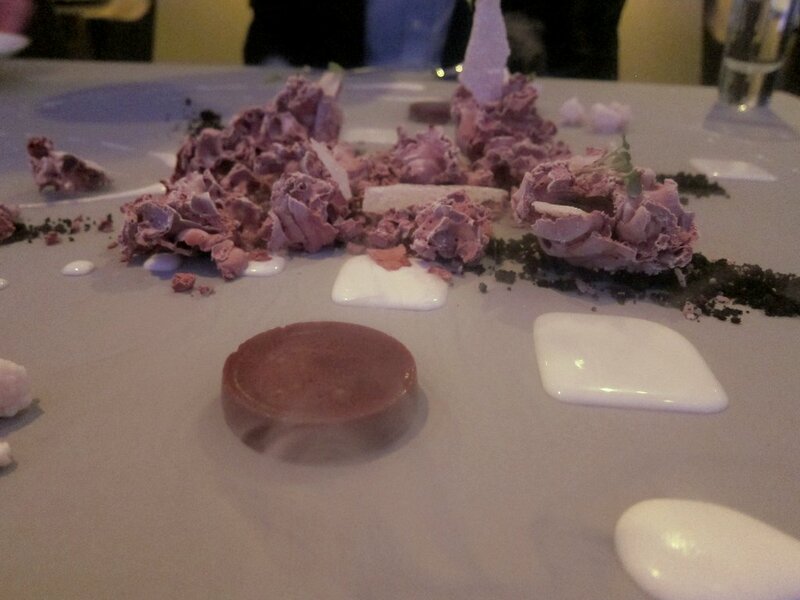 My friend who lives in Chicago just went to Alinea this past Friday. She said the wine pairings were amazing, but the meal was really rich. Can't imagine how it wouldn't be with all those courses! 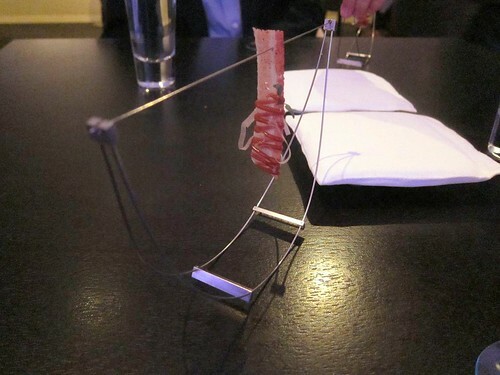 Hehe but we've been trained for these rich tasting menus. OK maybe that's not really a good thing lol. I was not uncomfortably full until the last dessert, then I got stuffed. 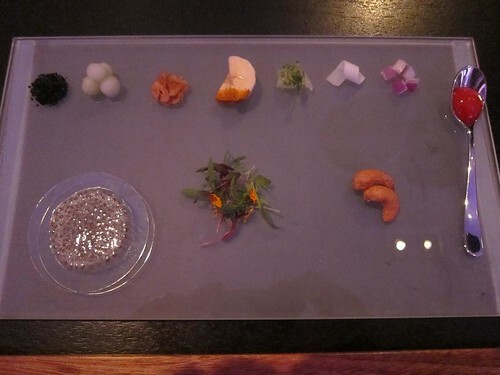 this rundown of your meal at Alinea. Seems that you enjoyed it at least as much as I did my meal. How did you like the pacing of the courses? I think the pacing is actually better here than at the French Laundry. Matt: I think I agree with you. At FL at times I felt that it was taking a bit too long, but it wasn't the case here. 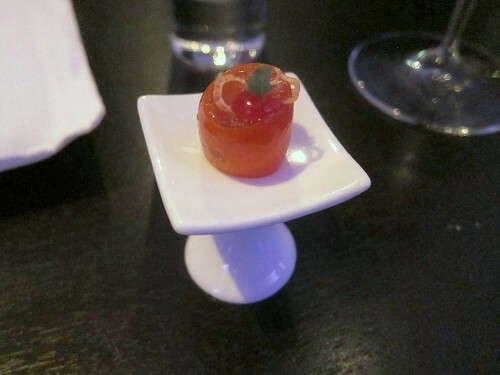 If you read the post, I asked for a "smaller" pairing and not all the dishes were paired with a wine, perhaps only half of the wines that a full pairing will get you. Enjoy your meal next week. thanks for the feedback. i remember reading about the "mini" pairing. 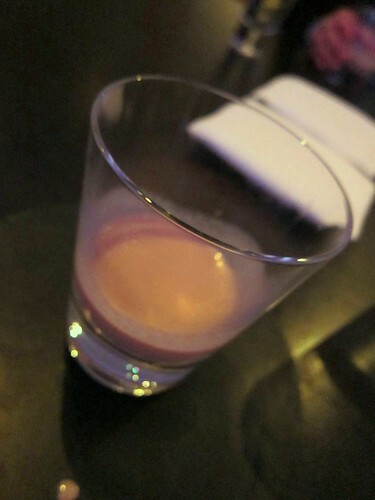 i thought that might be the half-glass of all the pairings, but maybe not. 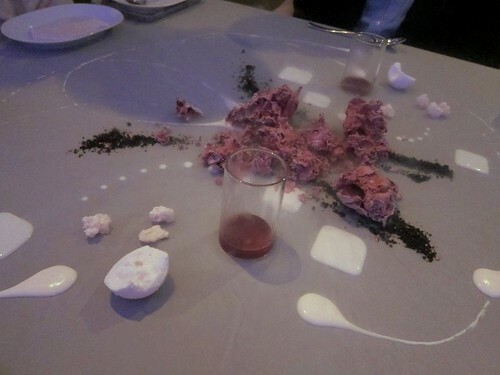 I've looked through the Alinea cookbook. I definitely need to make a trip to Chicago. This seemed like a "casual" meal for you. Or was it just too much to write up more extensively? Sneak Preview: Mendocino Farms (Marina del Rey)! Giveaway: Mendocino Farms Tasting Event!